Some of Ireland’s leading chefs, restaurateurs and high-profile environmentalists came together today to urge the EU to enact legislation to protect Irish soil. The Environmental Pillar today launched a new social media campaign – #Selfie4Soil – to boost public awareness of the People4Soil campaign at an event in Piglet Wine Bar in Temple Bar, Co Dublin. 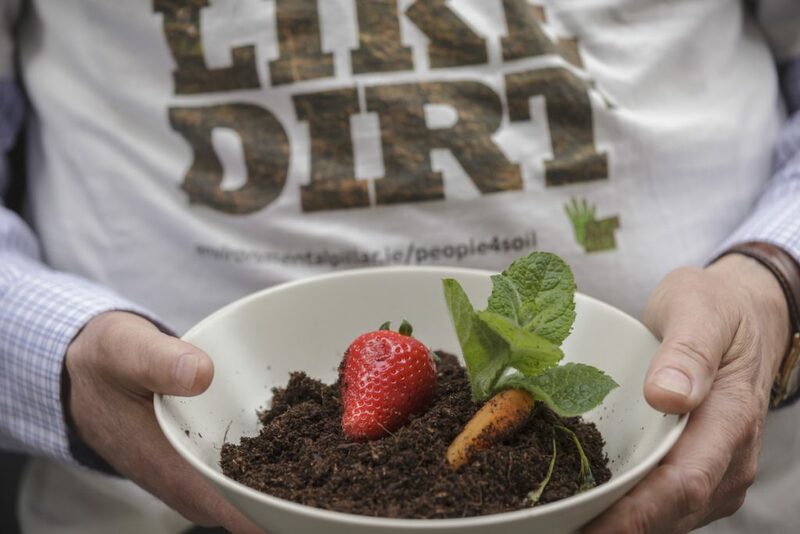 The Pillar – a coalition of 26 national environmental NGOs – is leading the Irish branch of the European-wide campaign calling on the European Commission to pass a Soil Directive to protect soils from pollution and mismanagement. In support of the campaign, the Pillar is asking people to sign a European Citizen’s Initiative petition, with 8,000 signatures required in Ireland for the petition to pass. The campaign has received the support of well-known chef and ‘slow food’ pioneer Darina Allen, Green Party TD Catherine Martin and TV presenter and high-profile environmentalist, Duncan Stewart. Healthy soils play an important role in combating climate change by acting as a carbon sink. Soil also helps ensures that we have clean water, supports biodiversity, and can help alleviate flooding issues. However, the health of Ireland’s soils has come under increasing threat in recent years from pesticides, afforestation, land use change, overgrazing, heavy industry and urbanisation. A 2015 report from the Economics of Land Degradation Initiative found that over half of arable land across the world is either moderately or severely degraded. Decreased vegetation cover and increased soil erosion is costing the world $10.6 trillion, or 17% of global gross GDP, according to the report. 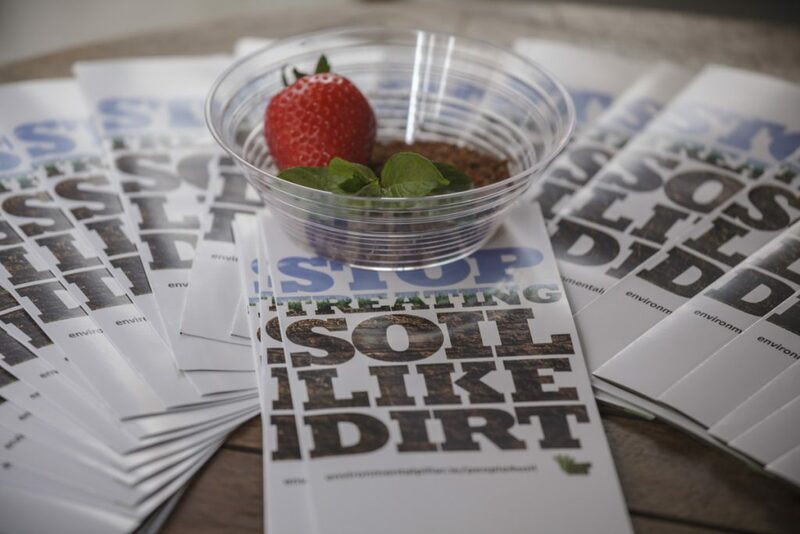 Edible-soil dishes were also presented at the event to highlight the fundamental role of soil for the food we eat. “Remember, if we don’t have rich and fertile soil, we won’t have good food and we won’t have clean water. So let’s stop treating soil like dirt,” said Darina Allen. “Each and every one of us totally depends on the four or five inches of soil around the globe for our very existence,” she added. People4Soil Ireland spokesperson Klaus Laitenberger added that we must learn to see soil as a valuable resource upon which “all of life depends”. “The biggest threat we face as a human species is the decline in soil fertility. We are losing soil at a massive rate and won’t have enough soil left to feed the growing world population if we continue to farm the way we do it,” he said. “It takes up to 1,000 years to form one inch of topsoil through weathering and natural processes. This means that only in a million years will new soil replace the amount we have lost so far. “So let’s stop treating soil like dirt and sign the petition,” he concluded. The event was organised to coincide with Earth Day on Saturday, 22nd April. 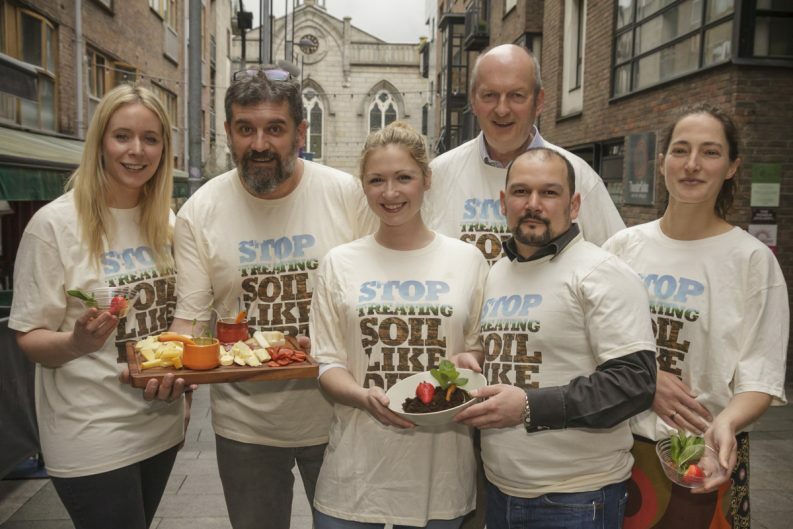 The People4Soil petition is also endorsed by Dee Laffan Chairperson of Slow Food Dublin, Cara Augustenborg Chairperson Friends of the Earth, Sinn Féin MEP Lynn Boylan, Caroline Byrne Secretary General of Euro-Toques Ireland, Thibaud Harang & Enrico Fantasia of Piglet Wine Bar, Matt Smith of Moy Hill farm and Giulia Caesar & Martin Obst from NCAD Community Gardens.